We don't know about you, but we sometimes get REALLY confused when we read Brownstoner. The descriptions that commenters post about our lovely PLG are (pardon the language, but we really cannot think of any better term) completely fucked. "I have close friends who've been the victims of exceptionally brutal crimes there over the last several years." "I guess we can agree that Lefferts is not for everyone. If you're someone who doesn't want a softball-sized gunshot wound, then it's probably not for you. " This is weird. We have a really tough time understanding claims that PLG is dangerous; we have an even tougher time understanding the aggressive nature of said (false) claims. What gives? Theory 1: Property owners in other neighborhoods that are sometimes perceived as dangerous (such as Bed Stuy) who are threatened by the appealing nature and growing activism of PLG. In other words, they're worried that property values will increase faster in PLG than their own neighborhood. Theory 2: Current residents of PLG who are sick and tired of seeing newbies arrive, changing the tenor of the neighborhood. Theory 3: Freaks who have nothing better to do than hate on PLG. Seriously though, we're grasping at straws here. ATP and our neighbors really enjoy living here (despite the lack of services in the nabe). Safety is hardly an issue, though we do take precautions(kevlar is not one of them). Well, seems that the folks at Brownstoner are talking about PLG again. This time, it's about a development in our neck of the woods, slated to be constructed at what will be 384 Maple St. But, this begs the question: is the yet-to-be-built 384 Maple in our neighborhood, even though it's all the way out there on New York Ave.
Whatever, who cares? The more important question is: would a developer really put that kind of money into the neighorhood? Would he/she get a decent return on the investment? Is there really a market for what are bound to be luxury condos in our unassuming hood? Is there really going to be a post referencing PLG on Brownstoner - sans catfight? 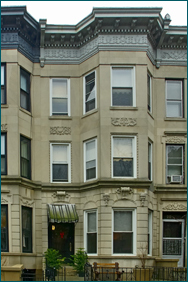 Driving from Clinton Hill to Victorian Flatbush, we were particularly struck by these two appetizing apartment buildings on Ocean Avenue. The Art Deco awning at No. 395 and the Tudor roofline at No.441 only whetted our appetite for the main course. 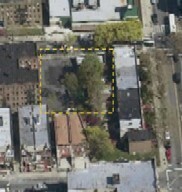 Built in 1924, 441 Ocean Avenue has 86 residential units across about 115,000 square feet of space. We're not sure if this is a co-op or rental. Anyone? The focus of another post is a building on Church Ave., which we think is just nifty. In honor of Brownstoner's love for nearby 'hoods, ATP will blatantly copy Brownstoner and take some snapshots of buildings in PLG that we consider to be noteworthy for their style. And, truth be told, those PPS buildings pale in comparison to some of the buildings we have around here. No doubt. Let the architectural wars begin. Plus, it will be fun to focus on some of the buildings in PLG, as the single family homes tend to steal the show around here. But you know what? Buildings are good enough, smart enough, and - gosh diddly-dang it - people like them. ATP doesn't even know what to say. We don't think that PLG folks are particularly belligerent, at least not in our day-to-day experience. But, nonetheless, here are some quotes from Brownstoner accumulated over the weekend. "Here we go again. If anyone says anything that's less than glowing about Lefferts, there's hell to pay. Good grief." "PLEASE STOP THIS DYSFUNCTIONAL ARGUMENT!!!!" Critics of Lefferts: Instead of phrasing your worries/concerns in terms of Lefferts, phrase them move vaguely in terms of NE Brooklyn or something like that. In general, avoid terms like "Lefferts" and "PLG". Residents of Lefferts: Please don't be overly sensitive and/or belligerent. If someone does say something you don't like about Lefferts, don't lash out at that person. Instead, feel free to criticize my nabe, Midwood. We're an easy target and we can handle it, so take your best shot! Are both sides willing to abide by these proposals? If so, then we might be able to get back to a more interesting discussion." Well, nice of someone to put their neighborhood up on the cross to spare PLG. But, are PLGers a little defensive? Do we have to be? Are our problems so bad? Whatever, we're definitely prettier than all the prettiest girls in Bed Stuy, Clinton Hill and Fort Greene COMBINED. Yeah, you heard us!! The name "Prospect-Lefferts Gardens" is actually a fairly recent construct, going back to the founding of PLGNA in 1969. 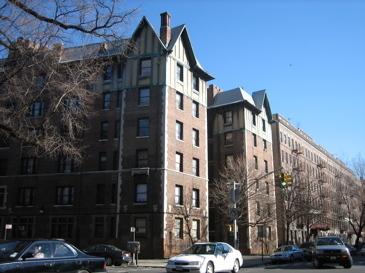 A number of brownstone neighborhood names are of similar vintage. ATP are not native Brooklynites, and we don't pretend to be. We are in no way connected to the history of Brooklyn and its neighborhoods by anything other than our present status as PLG residents. But, Prospect Lefferts Gardens seems like a mouthful to us. Why such a long name? Why such a difficult name to pronounce? Even a change as simple as leaving the "s" off of "gardens" would be an improvement. How about getting rid of a word? Or two? Or three? It's confession time: To save ourselves the energy necessary for explaining where and what PLG is, we sometimes we tell our friends that we live in Crown Heights. ...and ATP can only ask: why? "I don't know what you're smoking, but Lefferts can be very violent and very dangerous. If anyone doubts this, they should just go to Lefferts (preferably in the daytime) and walk about. If you have an iota of street smarts, it won't take too long to figure out that there's a lot going on there....mostly in the shadows." It's fair to say that this series of posts is actually quite tame as compared to previous rounds of hate for PLG on Brownstoner (though this is the first time we've noticed rumors of cannibalism; I was confident our dietary habits would remain our little 'hood secret). Why so much hate for PLG? What gives? Cuz, like, we like it here. Geez.